Everybody loves bread, right? Especially when it is freshly baked and hot. I personally am passionate about bread and every once in a while I like to try a new recipe at home. Anyway, I found the best bread ever, and I will share its recipe with all of you. Well, I love it honestly and if you don’t, then don’t tell me because you will never change my mind… ever. We start off same as making any other bread. In a cup or a small bowl, measure out ¼ cup of lukewarm water, a tsp of honey and a package of active dry yeast. Stir it all together and let the yeast mixture sit until it gets all foamy. In the bowl of your mixer, add about 1½ cups of the white flour, the whole wheat flour, salt and pepper, milk, olive oil and the foamy yeast mixture. Mix everything together using the paddle attachment over medium speed. Remove the paddle attachment and attach the dough hook. Add the olives and cheddar cheese to the bowl. Mix everything well, until the olives and cheese are well incorporated in the dough. We’re almost done with the dough, we just need to add about another cup of flour to the dough. Mix the dough for another couple minutes over medium speed. Shape the dough in a ball, and place it in an oiled bowl. Let it rise until it doubles in size, probably about an hour, but for me it took more like 40 minutes, because it’s really warm in the house. Dough Troubleshooting: If your dough is not firm enough, add some more flour. On the other hand, if it is too hard and it crumbles easily, add some more milk, or water. Flour a wood surface and lightly knead the dough a couple of times, then roll it out. After that, jelly roll it and place in a greased loaf pan with the seam side down. I just greased mine with some olive oil. Let it rise again for half an hour, while you preheat the oven to 375° F / 190° C.
Now bake it for about 40 minutes, until you get this beauty… and enjoy! In a small bowl, or the bowl of your mixer, mix together the water, yeast and honey. Let sit until it’s foamy. 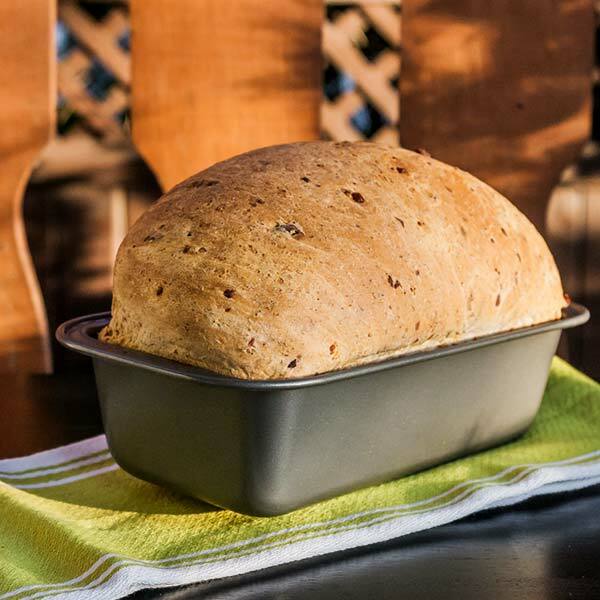 In your mixer bowl, add 1¼ cup of the all purpose flour, whole wheat flour, yeast mixture, milk, olive oil and salt and pepper. Using the paddle attachment, mix well. 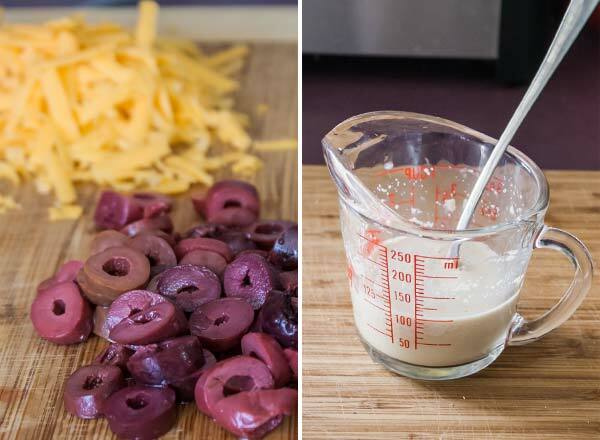 Add the olives and cheddar cheese to the mixer and continue mixing. Switch to the hook attachment. Add the remaining all purpose flour and mix for another 4 to 5 minutes, until the dough is nice and firm. Place the dough in an oiled bowl, cover with plastic wrap, and let the dough rise until doubled in size, for about an hour. Punch down the dough and place it on a floured surface. Knead it slightly a couple times, then roll it out into a long rectangle. Roll up the dough, jelly roll style. 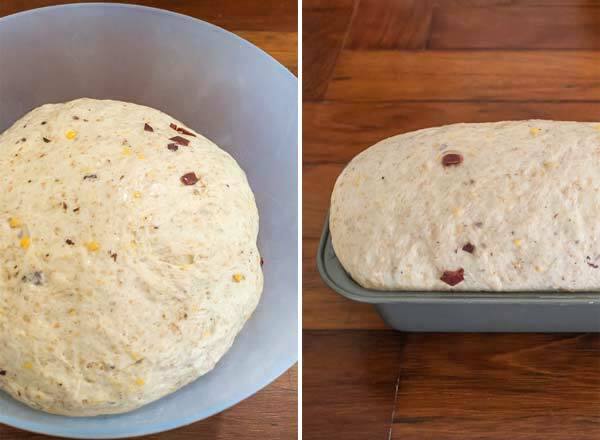 Place the roll in a greased loaf pan and let rise for another 45 minutes to an hour until it doubles in size again. Preheat the oven to 375° F / 190° C.
Bake the bread for about 40 minutes, or until golden brown. When you tap it, it should sound hollow.